Turbo trainers are a great tool that allows the rider to pedal, even when the weather outside isn’t great. In some cases, it’s a better alternative to going outside as we can control everything and complete our training more accurately. In order to make the experience as good as possible, its necessary to have certain guidelines in place. Try finding a place where you can get a nice fresh breeze. If possible, next to a window that you can open is the best solution. Keep in mind the noise you can make when pedalling. A floor mat cushions the vibrations that can occur, especially at high speeds. 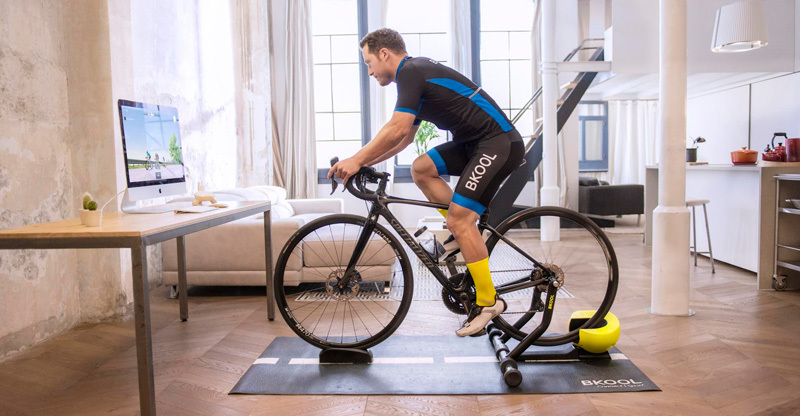 Bkool has a turbo trainer mat that’s made of an absorbing gel and helps removes vibrations. One of the main causes of limited performance is overheating, especially on more demanding sessions. Position the fan so that the flow of air does not directly hit you, but so that you feel a slight movement of the air around you. Make sure you wear cool and breathable clothing. We recommend a short or sleeveless shirt. As you are going to sweat a lot more than when you go outside, always have a towel for sweat on hand. Dry yourself from time to time, this will help keep the sweat out of your eyes and keep you focused on the finish line. Set a goal and before mounting the bike check that you haven’t forgotten anything. Make sure the bike is on the trainer correctly, the tire pressures are correct and that the seat is in the correct position. 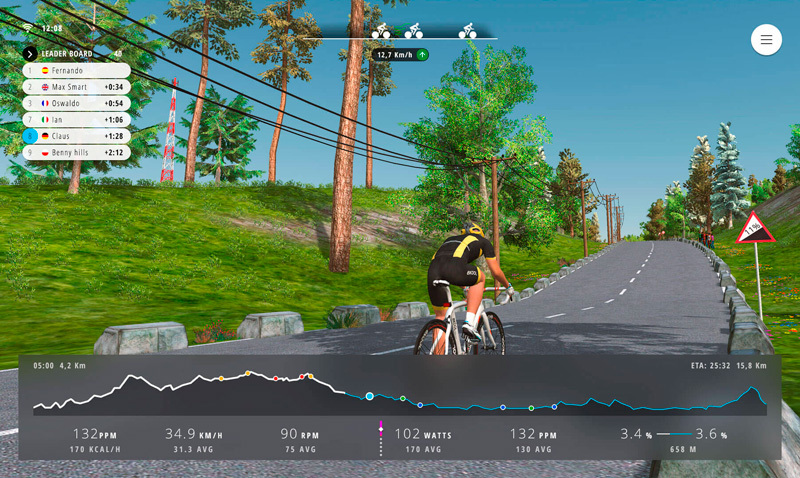 This will help you not have to get off the bike during the ride, resulting in a slow time or loss of position on the ranking. The goal can be simply to pedal a certain time or distance, complete a course or ride virtually with other cyclists. There will be days when you do not feel like riding and the temptation of sitting on the sofa is too much. Let Bkool motivate you. We have various options and tools that are guaranteed to motivate you to get on the saddle of the bike. Here’s a few: Join a challenge, participate in a league and go completing stages, ride with people from all over the world, add opponents, make classes, design your own workout, and much more. Do not forget to drink from time to time, but do not overdo it. Take something with salt. Carbohydrates would not be necessary unless it’s a long session. A homemade option can be 1g of salt, 1g of baking soda and a splash of lemon juice per 500ml of water. When we do indoor sessions we tend to maintain the same posture for a long time and to be tense. Relax your body, lower your shoulders, and try changing your position on the bike. Stand up from time to time, change hands on the handlebars, change the cadence and stretch your back from time to time. 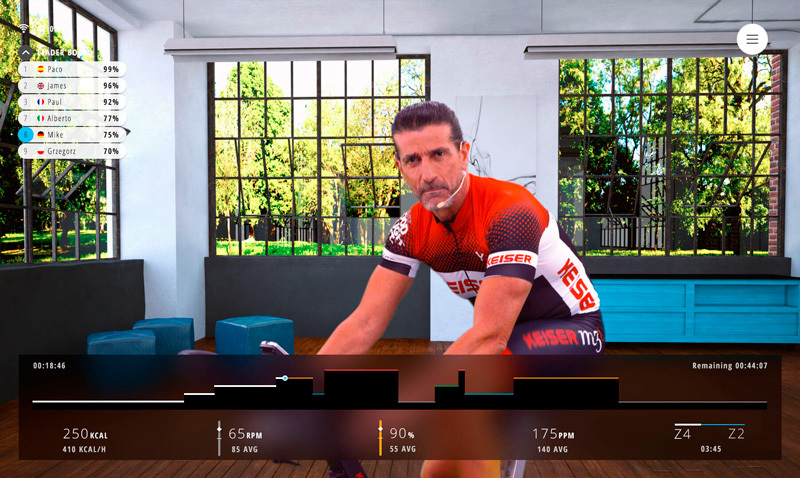 If you enjoy Bkool workouts or classes, it is important that you have your FTP (functional power threshold) updated recently. This data is used to calculate your zones. Update your FTP every so often so that the Bkool Simulator can regulate the resistance accordingly and show the correct information. In Bkool you can take an FTP test of 5 or 20 minutes, or if you know your FTP you can enter it in your profile manually.